A fall too far at Morar. With an extra day to spend in the Arisaig area it seemed natural to spend it in the Arisaig skerries but how best to get there? We could launch from our overnight accommodation at the Glenuig Inn and cross the Sound of Arisaig but we paddled half way across the Sound of Arisaig in our attempt to view the eclipse of the sun. 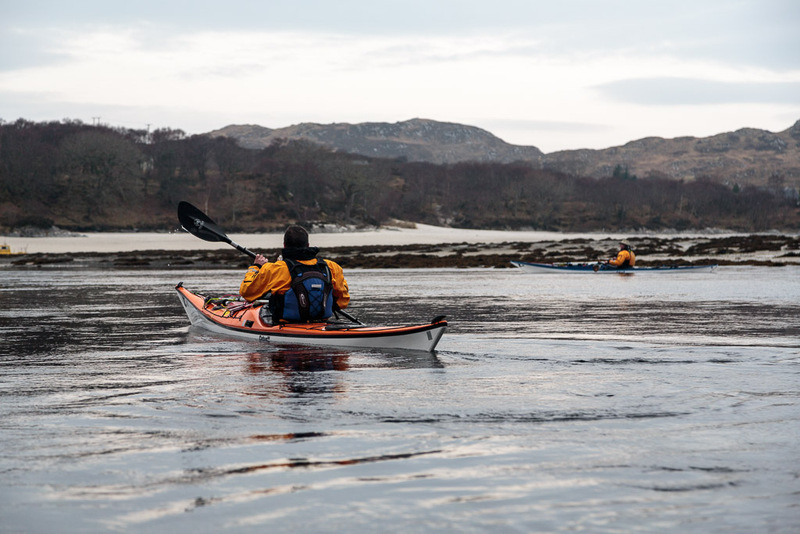 Then I discovered that Ian and Mike had never paddled in the estuary of the River Morar surrounded by its famous silver sands. Plan made! We would launch at Morar paddle south to the Arisaig skerries then take advantage of a forecast increasing southerly to paddle sail back. 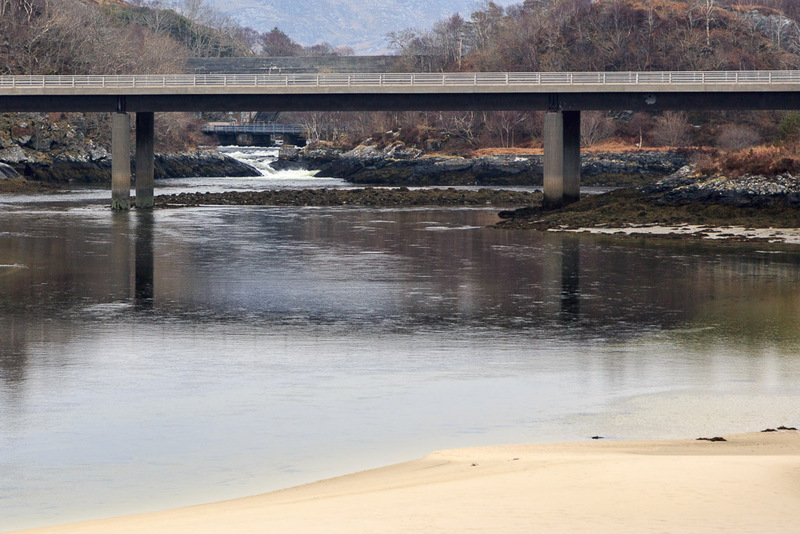 The River Morar is only 800m long but it drains Loch Morar the 5th largest loch in Scotland and with a maximum depth of 310m it is the deepest body of fresh water in the British Isles. It is actually deeper than the Atlantic continental shelf! Like Loch Shiel, it was a sea water loch after the Ice Age but as the land has risen, the glacial shelf at the mouth of the loch (where the glacier melted as it reached the sea) has risen and it has been fresh for thousands of years. From the loch, the river falls 10.1m to the sea. 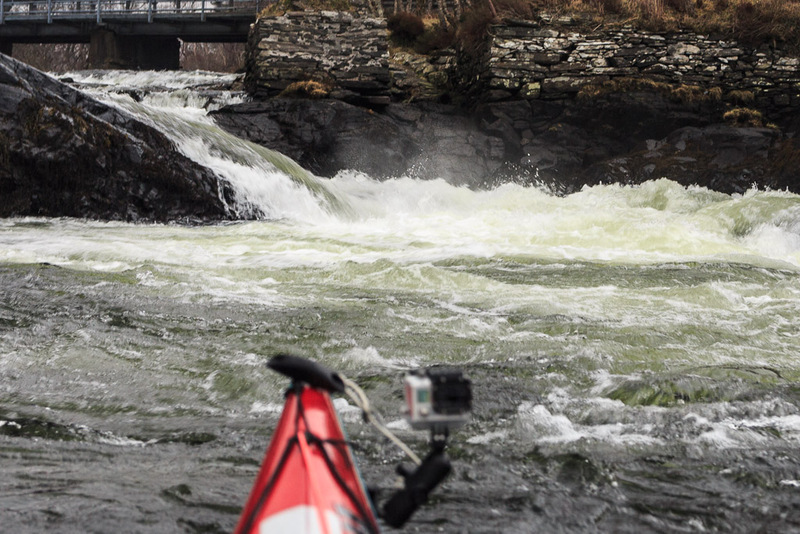 Technically it would have been possible to launch into the river and run the falls but we did not much like the zigzag nature of the rapid, nor the big volume of water in it , nor the somewhat frightening noise it was making. So we launched from a lay-by on the south side of the estuary head. If it is busy you can drop the boats here and park a short way away up the hill overlooking the estuary. 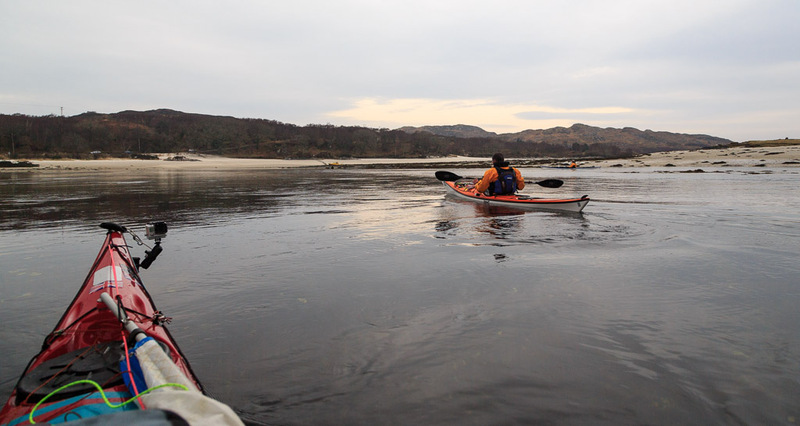 First we paddled under the new road bridge that carries the bypass round the village of Morar. We launch we had a stiff paddle against the current and up a considerable slope to the final rapid which is crossed by the old road bridge and the large arches of the railway bridge. 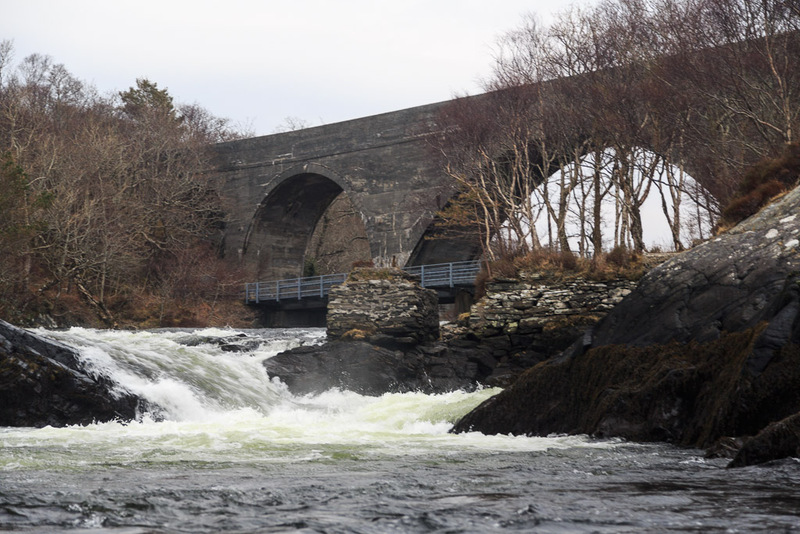 The railway from Fort William was built in 1901 to carry fresh fish from the fishing port of Mallaig (which at one time was one of the biggest herring ports in the UK) to London. ...on the nicely sloping water that had caused us much sweat just moments before. We were soon back at the silver sands of our launch point. This old dive boat wasn't going anywhere but we were bound for the Arisaig skerries! 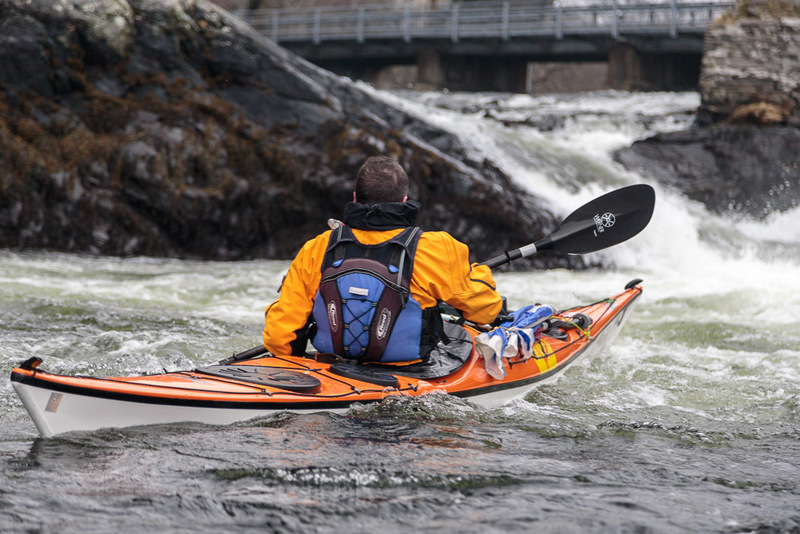 For the full sea kayaking stereovision experience, you can also read Ian's account starting here.